People waiting to catch a bus at the corner of Pico Blvd. and Motor Ave. on a recent July day were a prime audience for alcohol advertising, because four of the six ad panels in transit shelters there were marketing Tanqueray gin, Belvedere vodka, and Dos Equis and Heineken beer. And blocks to the west, another shelter on Pico Blvd. 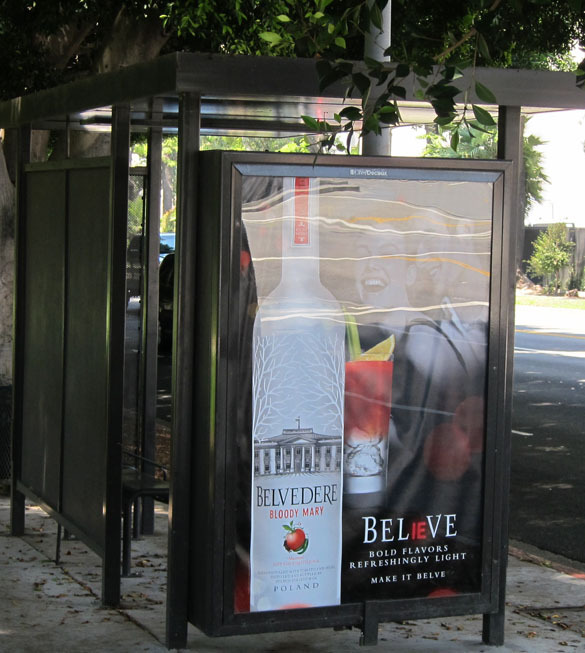 advertised Belvedere vodka, and six blocks further, at the busy intersection of Pico and Westwood Blvds., two shelters displayed ads for Tanqueray gin. 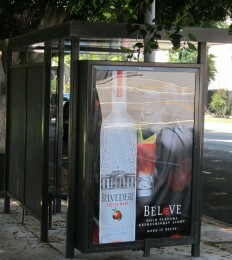 One of three bus shelters with alcohol ads at Pico Blvd. and Motor Ave.
Alcohol advertising isn’t exclusive to bus shelters and street furniture kiosks, of course, and a person traveling in the opposite direction that day would have encountered medium and full-sized billboards promoting Malibu Black rum, Hennessy and Remy Martin Cognac, and Bud Light, Corona Light, Miller Lite, Miller Genuine Draft, Coors Light, Stella Artois, Heineken, Kirin Ichiban, Victoria, and Modelo beer. In fact, on Pico Blvd. 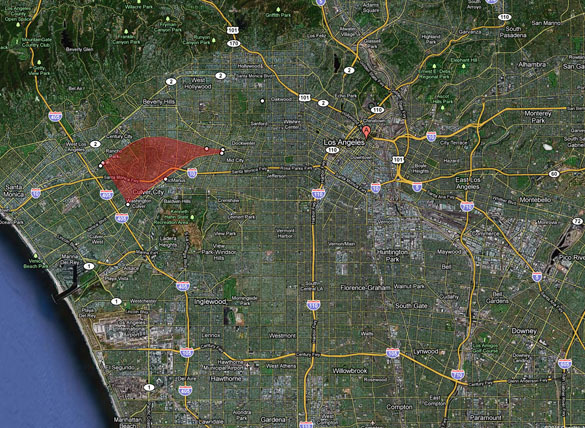 between Westwood Blvd. on the west and LaBrea Ave. on the east, a distance of just over five miles, one could have seen a total of 32 outdoor ads for alcohol, 21 on billboards on private property and 11 on bus shelters and kiosks set in the public right-of-way, targeting both motorists and the predominately youthful audience of bus riders. 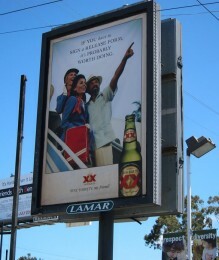 Dos Equis beer ad facing grounds of public high school just over 300 feet away. Lamar Advertising's stated policy is to keep such ads at least 1,000 ft. from schools and churches. Heading back west on Venice Blvd., the major commercial street that parallels Pico Blvd. on its route to the Pacific Ocean, another 10 alcohol ads could have been seen, five on billboards and five on bus shelters and kiosks. And on a short jaunt up LaCienega Blvd. 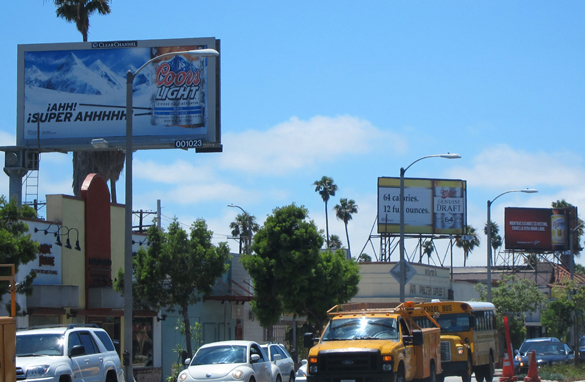 and Robertson Blvd., the two major commercial streets that run between Pico and Venice, one would have been confronted with another six billboards displaying ads for alcohol. 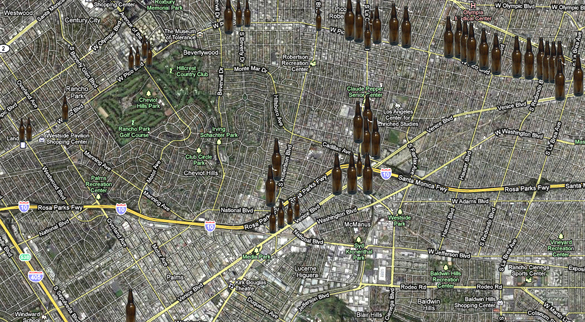 Which means that on one summer day, in one area no more than 10 square miles, or less than 3% of L.A.’s total area, there were 48 outdoor ads for alcohol, 16 of them right out on the sidewalk, on public property. What is the target audience for theses ads? Almost all the gin and vodka ads were on the west half of Pico Blvd., where the demographic is predominately white and upper middle-class. To the east, and along much of Venice Blvd., where the populace is significantly poorer and more heavily Latino, almost all the billboard ads were for beer, with the text of many in Spanish. The Coalition to Ban Billboard Blight is part of a coalition of community groups working for a city ordinance to prohibit alcohol ads on public property. For more about this effort, visit www.noalcoholads.org.